We have had a bit of a crazy time around here lately, which has made me super homesick for Australia. And when I get homesick, I crave macadamia and oats. This may seem like a weird combination, but just think of an amalgamation of ANZAC biscuits (oat based cookie for the non-Aussies), and white chocolate and macadamia nut cookies. Both of which, to me, are quintessentially Australian. 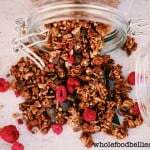 This easy homemade granola encompasses all of the delicious flavours going on in those cookies, but in a healthier breakfast cereal version. 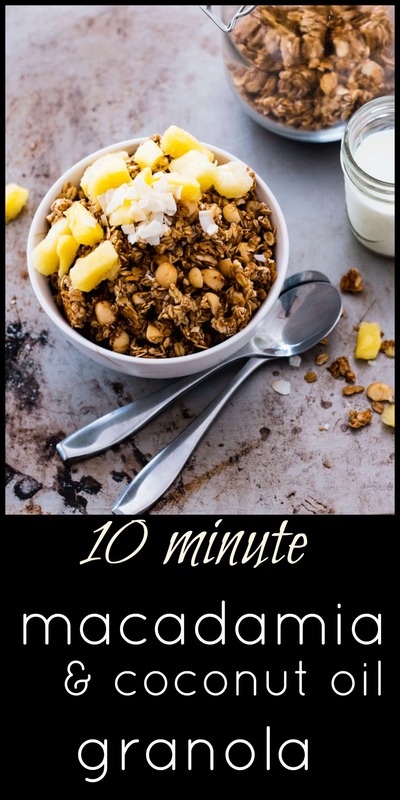 It only takes 10 minutes cooking time, which is unheard of in the world of granola. The result is some super crunchy clusters bursting with almond and macadamia nut goodness, which I just love. My favourite way to serve this granola up is to make it into a bit of a parfait. 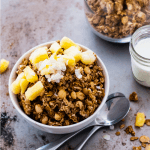 Just puree some pineapple in a blender and make a parfait with layers of pineapple puree, yoghurt, more pineapple puree, and a serving of granola as your top layer. Sprinkle a little bit of coconut on top and you are all set. If you are feeling super decadent, and Mother’s Day is coming up so that is totally allowed, you could even add some white choc chips to the granola mixture once it is completely cooled. Let me know what you think! Be sure to leave a comment 🙂 Happy eating. Sweet, crunchy and delicious, this super easy homemade granola with macadamias and coconut oil only takes 10 minutes cooking time. 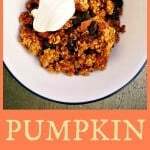 It is the perfect granola to make ahead and enjoy throughout the week, or make a double batch and freeze some for later. Thank you! This granola is fantastic! I made a double batch and it keeps perfectly. I stayed true to the recipe. Next up, the cardamom granola! Oh yay 🙂 You will LOVE the cardamom granola – it has just a little bit of a kick to spice up the morning routine! Homemade is always best! This looks fresh and crunchy 🙂 Now need a glass of Almond milk! Oh yes, macadamia nuts and pineapple. Is there a better flavor and texture combination anywhere? This looks and sounds outstanding! I;m a total sucker for anything macadamia nut and I love home-made granola! Love this recipe. I love granola and would be so happy with a granola Pineapple parfait for breakfast on Mother’s Day. Yum! I don’t use macadamia nuts enough. I need to get some! Me neither! They are that wee bit more expensive, so I always tend to save them for extra special dishes – but they are so so good, I need to start using them more! Oh lovely,! That would make a great start to the day. This sounds SO gorgeous! Macadamia is such an underrated nut, I think 🙂 Pinning this one for sure! Coconut and pineapple – love it! and love pina coladas..this looks so decadent and parfaits are my favorite. Thanks Donna. I love granola too. With so much customization, homemade are healthy and so much better than store bought. SO so yummy and crunchy!! Take me to the tropics! I really LOVE granola too! And homemade is SO much better than store bought. LOVE the macadamia nuts in here…they are a favorite of mine and I have never thought to put them in granola. A parfait is a terrific idea!